Save £1k on a new home in West Bromwich - and bag your carpets for free! The brand new showhome at Taylor Wimpey’s Frampton View development of new homes in Rushall, West Midlands, is being launched with a James Bond-themed celebration – From Rushall With Love! Leading housebuilder Taylor Wimpey is offering a View to a Thrill for West Midlands property-hunters looking for houses for sale in Rushall next weekend, when the brand new showhomes at Frampton View are opened with a James Bond-themed launch event. The first visitors to arrive at this popular new development in Station Road, Rushall, after 11am on Saturday 26th February will receive a special For Your Eyes Only look at the beautifully decorated property in Rushall. To mark the unveiling of the ‘Ashby’ and ‘Barwell’ show-houses in Rushall, a special celebration is being hosted inside the Frampton View Sales and Marketing Suite, including Taylor Wimpey’s very own Casino Royale roulette wheel and free vodka martinis for sophisticated guests – shaken, not stirred, of course. Carl Cooke, Regional Sales and Marketing Director for Taylor Wimpey, says: “We’re really excited to be launching our wonderful new showhomes From Rushall With Love, and we hope that property-seekers in search of property for sale in Rushall will take this opportunity to join in with some Bond-themed fun. A superb collection of properties is on sale now at Frampton View, including stylish two-bedroom starter homes from just £104,120* and spacious three-bedroom houses from only £120,695*. Selected new homes are available with Taylor Wimpey’s Easy Start shared equity scheme, which lets qualifying first-time buyers secure their new property for just 85% of the purchase price. Subject to status, a deposit of only 5% may be all that’s required, and the leading housebuilder will provide 15% equity in the form of an interest-free, 10-year loan, repayable in up to three instalments at the market value of the property. Alternatively, specialised assistance is available for those with a property to sell, including the easymover initiative, which sees Taylor Wimpey find a buyer for customers’ old homes in just a few weeks. Incentives can be tailored to customers’ individual circumstances and are subject to availability, with further information available from the Sales Executive. Frampton View enjoys an excellent location in the well-served village of Rushall, close to local schools, shops and pubs and home to the ruins of a beautiful ancient manor house and the regal Rushall Hall. Walsall town centre, located two miles to the south of the development, offers a wider selection of shops, cafes and restaurants, plus a variety of schools for children of all ages and the well-regarded Walsall College. A £1 billion regeneration, due for completion in 2015, includes the stylish Waterfront canalside project, while the town is already home to numerous sports clubs and facilities, plus Crown Wharf Shopping Park, with its array of leading high street shops, and IKEA Wednesbury, less than five miles from the development. Fine countryside lies to the north of Frampton View, with pleasant walks, particularly along Rushall Canal, which forms part of the historic Birmingham Canal Navigations. A wealth of employment and further leisure opportunities is just minutes from home via Rushall’s excellent transport links – including the M6 and Walsall railway station for direct services to Birmingham New Street and Wolverhampton. 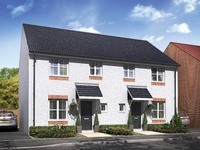 The development is just 10 miles from Birmingham city centre, nine miles from Cannock and Wolverhampton and eight miles from the cathedral city of Lichfield. The showhome launch at Frampton View is taking place from 11am to 5pm on Saturday 26th February, and anyone wishing to attend is advised to book an appointment. * Easy Start shared equity price based on 85% of the full purchase price. Offer is subject to availability and terms and conditions apply. Full details are available from the Sales Executive.